Get directions, hours of operation, and parts store access for Carl F. Statz & Sons. Carl F. Statz & Sons, Inc. began as an IH farm Implement dealer right in the Heart of Waunakee, in 1930. Today, our family owned and operated business is located just east of Waunakee on a 20-acre site right off of Hwy 19. Our commitment to quality service and personalized attention has remained unchanged since we opened our doors in 1930. We offer the best implement line-up in the state featuring brand names: Case-IH parts and service, Case skid steers, New Holland, Kinze, MacDon, Brillion, McCormick and Kuhn Knight, only to name a few. 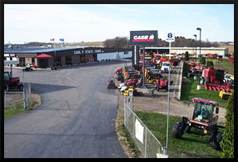 We have a wide selection of both new and used equipment at our Waunakee location. With over 100 years of combined sales experience in the implement business you can feel confident we'll provide you with what your farming business needs. We don't just carry and maintenance agricultural equipment though. We can take care of your outdoor power equipment, recreational equipment and maintenance needs as well. We offer outdoor power equipment manufactured by: Cub Cadet, Toro, and Woods. We carry a complete selection of Polaris Snowmobiles, ATV's and UTV's. With Polaris' almost 50 years of quality engineering we know we're providing quality equipment to our customers. You can also check out our line of mopeds, and while you're here take a look at all of our other brands of outdoor power equipment & recreational equipment that we offer through our used equipment sales. Take a look at our web site to see our vast selection of implement equipment, outdoor power equipment and recreational vehicles or Contact one of our representatives directly. If we don't have what you're looking for, we'd be happy to locate it for you. In need of equipment for the day or week, contact Carl F. Statz & Sons, Inc. to see what equipment we have available for rent. At Carl F. Statz & Sons, Inc., we stand ready to provide you with just the right equipment to fit your agricultural, outdoor, recreational, or maintenance needs. Please contact us today, to let us know how we can help.